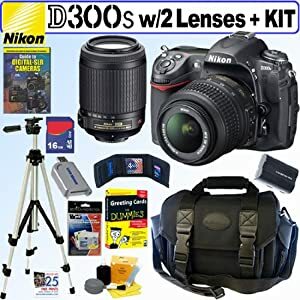 The Nikon D300s SLR Digital Camera builds upon the success of the D300 by adding 720p HD Video Recording. With a 51-point autofocus system, 100% viewfinder accuracy, 7 frames per second continuous shooting, and low light sensitivity (expandable to ISO 6400), the D300s boasts a professional-grade feature set in a compact, highly durable, metal body. The 12.3 megapixel image sensor coupled with Nikon’s exclusive EXPEED processor ensures ample resolution for discerning shooters with vivid, life-like color and detail. Nikon AF-S DX-Nikkor 18-55mm f3.5-5.6G VR, a lens featuring a built-in Silent Wave Motor and Vibration Reduction (VR). The AF-S DX-Nikkor 18- 55mm f3.5-5.6G VR is an affordable, and compact, 3x zoom lens covering the most frequently used focal range of 18-55mm with amazing versatility. Nikon 55-200mm f/4-5.6G ED AF-S VR DX Zoom-Nikkon lens: with 35mm equivalent of 82.5-300mm * 2 ED (Extra-low Dispersion) lens elements for maximum sharpness and contrast * Super-integrated coating minimizes ghosting and flare for more vivid images in dim lighting. * Silent Wave Monitor produces quick and quiet high-speed autofocusing * lens construction: 13 elements in 9 groups.